This article is about the American footballer. For the rugby player, see Felix Jones (rugby union). For the fictional foster care social worker, see Fair City. For the English actor, see Felix Aylmer. 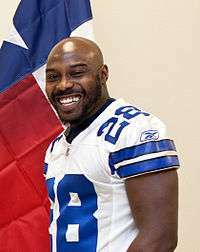 Felix Jones, Jr. (born May 8, 1987) is a former American football running back. He played college football for the University of Arkansas, and was recognized as a consensus All-American. He was drafted by the Dallas Cowboys in the first round of the 2008 NFL Draft. Jones was born in Tulsa. He attended Booker T. Washington High School in Tulsa, Oklahoma, where he was a standout in football and track. As a junior, he sustained a broken ankle early in the season, but still managed to rack up 800 yards rushing and 20 touchdowns. He was named the Tulsa World Player of the Year following his senior season, after rushing for 2,282 yards and 48 touchdowns, leading his squad to a 13-1 record and a state runner-up finish. In track & field, Jones competed as a sprinter and jumper. He recorded a personal-best time of 10.87 seconds in the 100 meters, and was a member of the 4x100m relay (43.30 s). In jumping events, he cleared 1.89 meters in high jump and 6.73 meters in the long jump. Regarded as a four-star recruit by Rivals.com, he was ranked as the No. 19 athlete in the nation and the No. 4 overall player in the state of Oklahoma. He chose to attend Arkansas over scholarship offers from Tennessee, Oklahoma State and LSU. 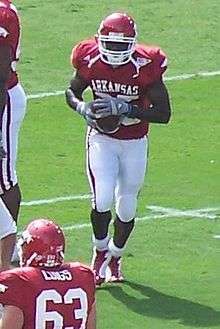 Jones attended the University of Arkansas, where he majored in kinesiology and played for the Arkansas Razorbacks football team. While serving primarily as the back-up for All-American and two-time Doak Walker Award winner Darren McFadden, Jones was used in a variety of ways alongside McFadden and fullback Peyton Hillis in the Arkansas backfield. In the Wildhog formation, Jones was used as a runner, receiver, blocker, or simply a decoy. Jones gained fame for his ability in returning kickoffs, returning four kicks for touchdowns during his college career. Jones before the Alabama game in 2006. In the 2006 season, Jones rushed for 1,168 yards and scored 6 touchdowns on 154 carries, and averaged 8.7 yards per carry. He was also an all-American kickoff returner and had one touchdown on a 100-yard kickoff return against Ole Miss, and caught 15 passes for 107 yards and three touchdowns. Jones alongside McFadden and Peyton Hillis, it was the first time in University of Arkansas history that two different running backs rushed for more than 1,000 yards in the same season. Jones was a first-team All-SEC by the conference's coaches, and second-team All-SEC by the media. That team finished 10-4 and won the SEC Western Division title. Jones finished with 123 carries for 1,162 yards and 11 touchdowns, while averaging 9.1 yards per carry, leading the nation. In addition, he led the Southeastern Conference in kickoff returns with 18 for 564 yards and two touchdowns, averaging 31.3 yards per return. Jones also had 13 receptions for 111 yards. 2007 marked the second straight year that Jones and McFadden have each eclipsed the 1,000 yards rushing in a season. The 2007 Razorbacks finished 8-4 before losing to Missouri in the January 1, 2008 Cotton Bowl Classic. Jones was named to the first-team All-SEC squad as a kick returner, and the second-team All-SEC as a running back. He was also named an All-American kick returner. After being hired as the Razorbacks' head coach, Bobby Petrino stated that Jones was his "highest recruiting target" and soon met with Jones to discuss his future with Arkansas. However, Jones decided to forgo his senior season to enter the 2008 NFL Draft where numerous publications projected him to be taken in the first or second round. Looking to acquire a running back that could complement the bruising style of starter Marion Barber III, the Dallas Cowboys drafted Jones in the first round of the 2008 NFL Draft (22nd overall), passing on other running backs like Rashard Mendenhall, Chris Johnson, Matt Forté, Ray Rice and Jamaal Charles. The decision process for his selection was captured in the fourth season (2008) of HBO's Hard Knocks series. He signed a professional contract on July 26 for $10.53 million, with $7.67 million guaranteed, including a $3.57 million signing bonus. The expectations were high in his rookie season, on his first rushing attempt in the NFL Jones ran for an 11-yard touchdown in the third quarter of a 28–10 victory over the Cleveland Browns. On September 15, during a Monday Night Football game versus the Philadelphia Eagles, Jones returned a kickoff 98 yards for a touchdown in the first quarter of a 41–37 win, which earned him NFC Special Teams Player of the Week. In his third professional game, Jones ran for a 60-yard touchdown against the Green Bay Packers on November 21. In Week 6 against the Arizona Cardinals, Jones tore his left hamstring. During his recovery process he also suffered a torn ligament in his left toe and was placed on the injured reserve list on November 20. In his first year he displayed an explosiveness that was difficult to defend for opposing teams. In his second season he received more carries per game and against the New York Giants he rushed 7 times for 96 yards and a touchdown. After never rushing for more than nine carries in a professional game, he reached the double digits mark against the Carolina Panthers, where he also had his first career start in place of an injured Barber, recording 8 carries for 94 yards (11.8) and one reception for 20 yards, but also suffered a sprained PCL in his left knee during the third quarter that ended his day and would make him miss two additional games. He returned to action against the Atlanta Falcons, where he also started but wasn't very effective, registering 8 carries for 36 yards and 2 receptions for 6 yards. He began to average over 10 carries per game after the week 13 game against the New York Giants. Against the Philadelphia Eagles he rushed 15 times for 91 yards with a touchdown. In the regular season, Jones set a Cowboys franchise record in average yards per carry with 5.9 yards, the tenth most since the AFL-NFL merger. He finished the year taking the main running back role over Barber and recording 569 total yards in his last 6 games, while averaging 6.2 yards per touch. In the first Cowboys playoff win since 1996, playing against the Philadelphia Eagles in the NFC Playoff Wild-Card game, he led the team with 16 carries for 148 yards (including a 73-yard touchdown run) and a 30-yard reception. His 148 yards are the third-most rushing yards in a playoff game in team history and his 73-yard run is the longest in franchise postseason history. He also became the first NFL player with 400 rushing yards on fewer than 50 career carries since Bo Jackson did it in 1987. In 2010, he bulked up to 225 pounds in order to improve his durability and was officially moved to the top of the depth chart at running back. He rushed for 109 yards on 15 carries against the Tennessee Titans, for his first 100-yard game. He played in all 16 games for the first time in his career, starting seven games together or in place of Barber and leading the team with 800 rush yards on 185 carries (4.3 yards average) and a touchdown. Against the New York Giants he had the longest reception in his career (71 yards). In 2011 after Barber was released by the Cowboys, the expectation was that Jones would be the primary running back. He also slimmed down into the 210-215 pounds range, in order to regain some of the explosiveness he lost in the previous year. After suffering a left high ankle sprain in the fifth game of the season against the New England Patriots, the four games he missed gave rookie DeMarco Murray the opportunity to earn the starter position. Against the New York Giants, Murray was lost for the year when he broke his ankle in the first quarter, giving Jones a chance to rush for 106 yards and have 6 receptions for 31 yards. He rushed for 108 yards on 22 carries, and added 3 receptions for 23 yards against the Tampa Bay Buccaneers. He finished the year with 585 rushing yards on 127 carries (4.6 average) and 33 receptions for 221 yards. Jones missed the entire 2012 offseason workouts because of shoulder surgery and failed the conditioning test at the start of training camp. Used in a change-of-pace back role, his best game came against the eventual Super Bowl champions the Baltimore Ravens, when he replaced an injured Murray and finished with 18 carries for 92 yards and one touchdown. After playing in all 16 games and having 7 starts, he battled through knee injuries to finish with 664 yards from scrimmage and a career-worst 3.5 yards average per carry. The Cowboys decided not to re-sign Jones after the season, making him a free agent. During his 5 years with the team he registered 2,728 rushing yards, with a 4.8 yards average and 11 touchdowns, while also adding 1,062 receiving yards with 3 touchdowns. On May 14, 2013, Jones signed a one-year contract with the Philadelphia Eagles who were looking for him to backup LeSean McCoy and Bryce Brown. After being passed on the depth chart by Chris Polk, he was traded to the Pittsburgh Steelers in exchange for linebacker Adrian Robinson on August 23. 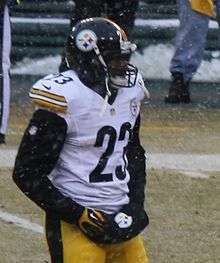 The Pittsburgh Steelers acquired Jones for depth purposes, while rookie Le'Veon Bell was recovering from a mid-foot sprain. He was named the starting back in week 2 against the Cincinnati Bengals rushing for 37 yards on 10 carries. He lost the starter role the next week against the Chicago Bears, where he had 7 carries for 34 yards and was benched after a costly third quarter fumble. He was not re-signed at the end of the year. After not playing football for a year, Jones participated in the first NFL Veteran Combine. ↑ Phillips, Rob (2008-07-26). "Felix Jones signs; Arrives for second practice". Dallas Cowboys. Retrieved 2008-09-15. ↑ "Romo throws for 320 yards, Dallas defense controls Cleveland". ESPN. 2008-09-07. Retrieved 2008-09-15. ↑ "T.O. moves into 2nd on TD receptions list as Cowboys win shootout with Eagles". ESPN. 2008-09-15. Retrieved 2008-09-15. ↑ Mayer, Larry (2013-07-10). "Peete following in his father's footsteps". Chicago Bears. Retrieved 2013-07-11. ↑ Rosenthal, Gregg (August 23, 2013). "Felix Jones traded from Philadelphia Eagles to Steelers". NFL.com. Retrieved August 23, 2013. ↑ "NFL to host inaugural Veteran Combine". NFL.com. March 11, 2015. Retrieved 2015-03-22. ↑ Orr, Conor (March 22, 2015). "What we learned from the Veteran Combine". NFL.com. Retrieved 2015-03-22.